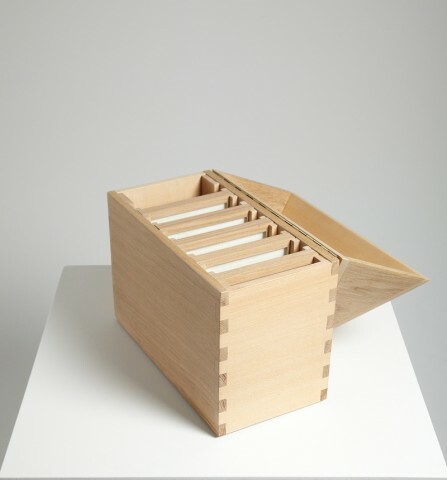 Sculptor Marion Smith and poet Deryn Rees-Jones collaborated in a piece that also formed a kind of architecture for words. 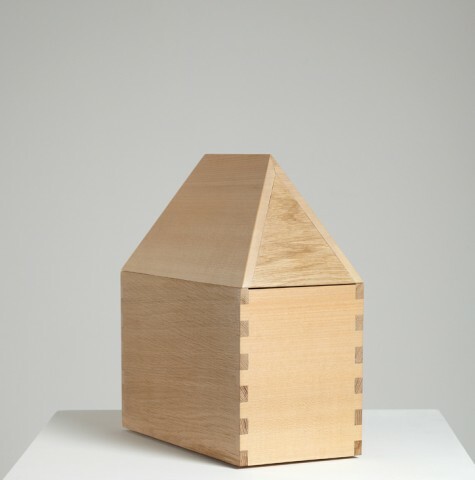 In this piece, aspects of reliquary and beehive merge in a form that could equally be associated with house shapes. A reliquary is a container for relics, often used in churches to hold the bones or remnant fabrics of saints and holy martyrs. From about the fourth century AD, these reliquaries were often stored in the altars of churches, brought out for certain holy days. The sacred objects within represented two aspects of holiness. One was to endow the altarplace with the association of the saint whose remains were kept there. The second aspect was that in its reliquary, its consecrated container, it remained inaccessible. The remains were acknowledged to be there, but unseen, closed away. Their invisibility added to the sense of mystery, working as a metaphor for the spiritual but unseen presence of a deity. 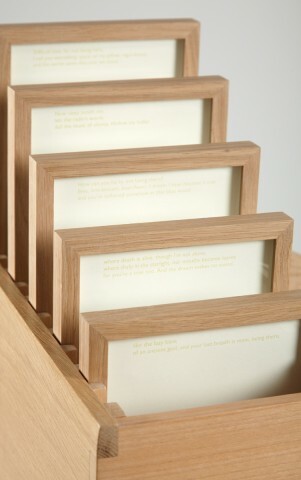 This, then, has a parallel with the artwork entitled Vivam here: the ‘leaves’ of the poem are printed on glass, in frames that rest within the case. 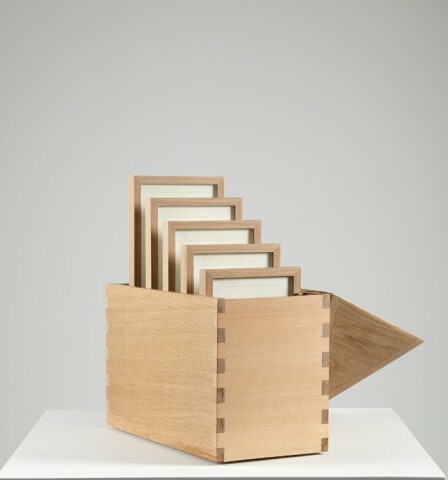 A viewer who interacts with this piece must act like a beekeeper, lifting combs from a hive, reading subsequent lines of the poem in the consecutive frames, deriving the succour from the hidden interior. 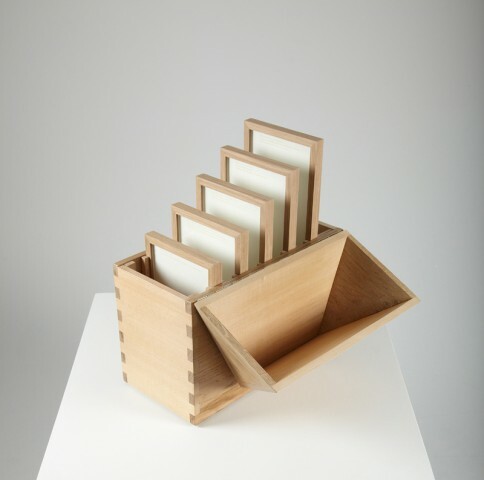 If the meaning of the word ‘sacred’ is extended in a secular sense to mean ‘revered’, then Marion has constructed an artwork that sequesters Deryn’s poetic text in a special place. Marion Smith, born and currently based in Fife. She studied at Gray's School of Art, Aberdeen. On graduating she worked at the Scottish Sculpture Workshop in Aberdeenshire. She has worked as manager of Glasgow Sculpture Studios and at Glasgow School of Art. She has exhibited in the UK, Scandinavia and Japan, and was elected to the Royal Scottish Academy in 1998. Deryn Rees-Jones' most recent collection of poems is Falls & Finds (Shoestring, 2008). Seren has published three collections of her poems, including Signs Round a Dead Body (1998) and Quiver (2005). Her critical work includes a monograph on Carol Ann Duffy, and a book of essays Consorting with Angels. In 2010 she was given a Cholmondeley Award for achievement in poetry.